Tooth decay is one of the most common diseases among Americans, particularly children under fifteen. Essentially, bacteria creates acid in your mouth which leads to decay due to the formation of plaque. When the decay has worsened to the point where there is a hole, a cavity has formed. 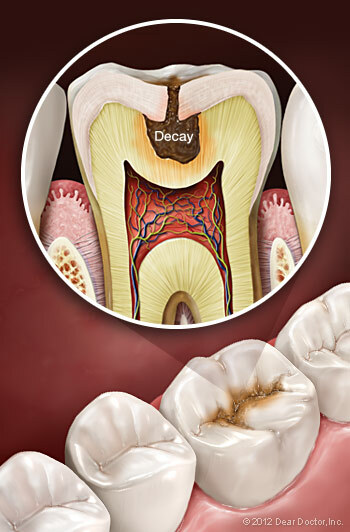 As the decay deepens, it goes through more layers of your tooth. Your tooth has three layers; the enamel, dentin, and the pulp, which is the innermost layer, containing nerves and blood vessels. The further in the decay, the worse the damage. The main causes of tooth decay is poor oral hygiene and your diet. Without proper daily brushing and flossing, along with trips to the dentist, your mouth will be a breeding ground for tooth decay. Bacteria in your mouth convert sugars and starches into the acid that combines with your saliva to create plaque, causing tooth decay. By eating or drinking too much bread, candy, cereal, cake, milk, soda, etc., you are at a greater risk of tooth decay. This is not to say that you cannot eat carbohydrates; your body needs these nutrients to function. However, knowing what kinds of foods are more likely to cause tooth decay means that you can prevent this disease easier. While anyone can be negatively affected by tooth decay, there are preventative measures you can take to attempt to ensure that your teeth do not experience decay. As mentioned previously, sugars and starches are the main culprits as to what the bacteria in your mouth cling to. Therefore, when you eat a meal that is particularly heavy in either, make sure to brush your teeth soon after. If you aren’t already, brush your teeth at least twice a day, especially right before you go to bed. Your toothpaste ought to contain fluoride, and the water you drink should as well. Your dentist can provide assistance in preventing tooth decay. If you feel that your teeth should be stronger, we can offer supplemental fluoride. In addition, we can also cover your back molars with a dental sealant for further protection. Sealants are a great way to prevent tooth decay in your back teeth, which can be missed with basic brushing and flossing. Sealants are particularly good for children, who are more susceptible to tooth decay, as well as less likely to make sure to brush their back teeth. If you really want to prevent tooth decay, the most important thing to do is practice great oral hygiene. Brush often, floss daily, and visit the dentist for regular cleanings. Tooth decay is very common, but it is also preventable. However, if you think that you may have a cavity, call Dental Professionals today at (773) 327-4442!